It’s not that often you see a Moto Morini based Café Racer featured on Moto Rivista, although we are always on the hunt for them. David from AD HOC Café Racers must have read our mind because he has just sent us his custom creation a Moto Morini K2 Café Racer. Our telepathic communication must be getting better; David and his bike are perfect to be featured on Moto Rivista. David’s custom workshop AD HOC Café Racers is located in a quiet mountain just outside Barcelona. Having previously restored the classics David started building Cafe Racers a couple years, it was about a year ago that he got really serious about cafe racers and we are now lucky to see the results! The first one to roll out from his AD HOC Café Racers workshop is this “Moto Morini K2 Café Racer. The build started with the frame, which was heavily modified and all the unnecessary tabs were removed to adapt the new style. The subframe was shortened and the entire frame was chromed out. The stock Moto Morini K2 engine was polished and features a shorter Megaphone exhaust system, which has been slightly elevated to match the lines. Adapting spoked wheels was quite a challenge for this build, the front wheel features a Honda Transalp dual disc front hub, which was nightmare to find says David while the rear wheel features a Moto Morini Coguaro hub. The bike also features a modified fiberglass Europlast tank, rear cowl and a solo seat. The polished modified rear fender is from an old Puch cut. The lighthouse comes from a Honda and the mirrors are an adaptation of several mirrors. The instrument panel carries only a tachometer the mantra of less is more is well applied on this Café Racer. All the electricals have been simplified and a smartly hollow battery box has been fitted to become a tray for gloves! 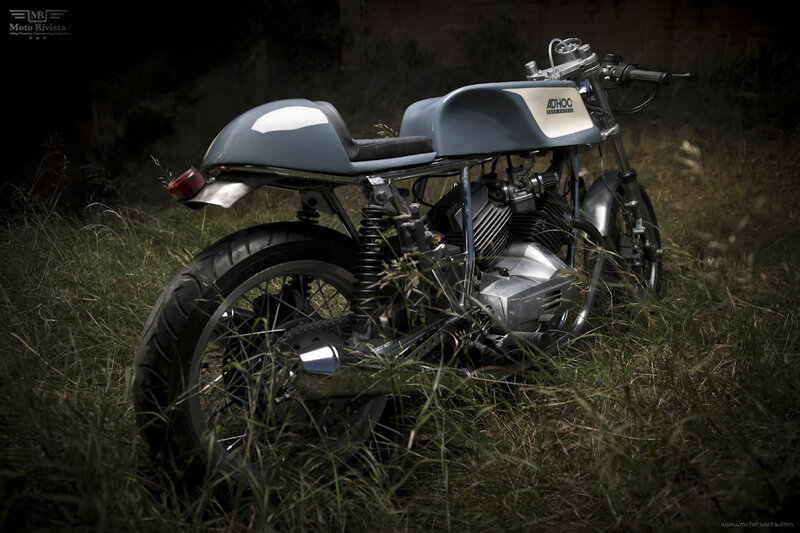 The finished Moto Morini K2 Café Racer was painted in classic tones of stone gray and cream colors. I couldn’t ask any more than this true classic Ad Hoc transformation, well executed David. It’s quite obvious that custom bikes from Spain are no disappointment, we are keeping a close eye on you David, keep on building bikes like this! Fire up the image gallery to enjoy the beautiful photographs captured by Sebas Romero.